Pour milk into a glass jar along with chia seeds and mix it together until all the chia seeds are coated with the milk. Put the jar into the refrigerator and let cool - you can store this overnight for quick access in the morning, or if you have time, I had it sitting for about 30 minutes in the morning. In the first 10 or 15 minutes of it's chill time, take it out and stir to reduce any clumpiness. This chia seed and milk combination will thicken and turn into a "pudding". Bring water to a boil in a pot on medium heat. Add oats to the boiling water and let simmer uncovered for about 2 minutes. Meanwhile, fluff eggwhites in a bowl until nice and frothy; pour the eggwhites into the oatmeal after the 2 minutes of simmer time and continue stirring for another 2 minutes. Add in the coconut extract a little at a time and mix it all together. I kept adding more until I could really smell the aroma of the coconut and pretend I was on a tropical island, hula skirt, dance, and all. Cook for another final minute, and let cool for a few minutes. 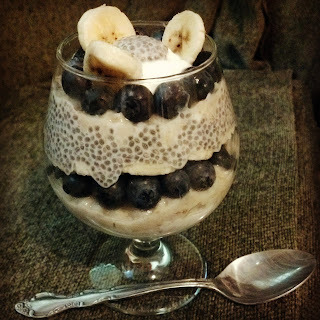 Remove the chia pudding from the fridge and in an adorably cute container, meticulously layer the pudding, oatmeal, yogurt, banana slices, and blueberries - the adorably cute container is not necessary...heck, if you don't have time, just mash it all together in a bowl - it probably will taste the same and take less than half the time to arrange (it really is time consuming to layer in an attractive, non-messy way...I'm not sure if people would try it if it looked like mush though!). If you want a more "tropical" feeling coconut oat parfait, add in some mango or pineapple! Serve and dance the hula, just don't spill on yourself!